Enjoy our favorite cookie-book blogs from our December 2016 baking binge! My grandmother was one of those people who was absolute fabulousness in the kitchen. Kitchen creativity was a way of life for her. Some of my favorite memories of childhood holidays involve her homemade cookies and pies. Being a chocolate fan, her refrigerator pie was my favorite. This chocolate pie had a hard, crusty outer shell and a chewy, fudge-like center. It was meant to be served cold (hence the “refrigerator” name) with whipped cream, I actually liked it best slightly warmed and served with vanilla ice cream (a much denser and crunchier version of a brownie sundae). Although I’ve never been able to replicate this pie, one bite of the Cocoa-Tahini Cookies with Sesame Crunch brought back a flood of memories. The crunch in this cookie was so easy to make – and along with the tahini adds a nice undercurrent of nut to the chocolate cookie. It also makes for a perfectly crunchy outside and a chewy fudge inside. The only thing this cookie is missing is the vanilla ice cream! I have to start with..... OMG!! Just took the Tarragon Apricot cookies out of the oven. Waited till they cooled, and that took some self-control, and then took bite. And as I said OMG!!! What a flavor. The combination of tarragon, with its hint of licorice, and the sweetness of the apricot is just amazing. Again, Dorie Greenspan has come up with another fantastic cookie. Putting the recipe together was relatively easy. And now after working with a number of Dorie’s recipes I'm feeling much more comfortable and truly enjoying every minute. As for this wonderful cookie, I had to wrap them carefully and place them in the freezer. Know why? Because little by little, I would have eaten every one of them. 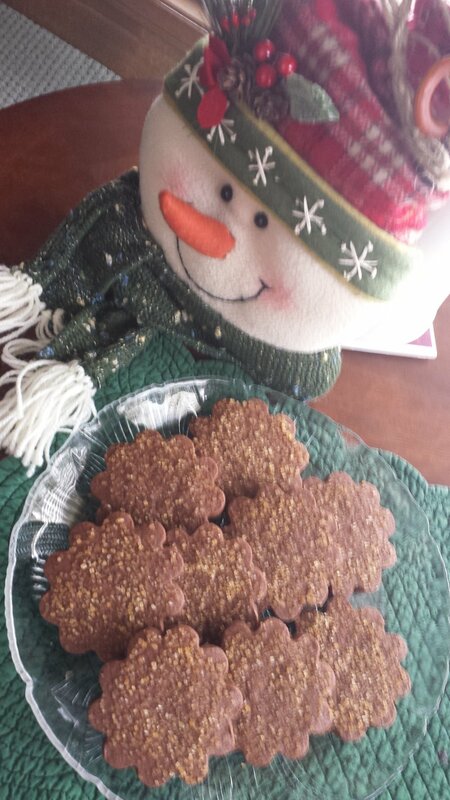 Now I will serve them Thursday night for my little Christmas party. I know my friends will love them. In following the recipe’s procedure, it truly makes you think about how much creativity, technical points and the understanding of flavor combinations goes into creating a cookie recipe. Dorie has it all and is an amazing chef. 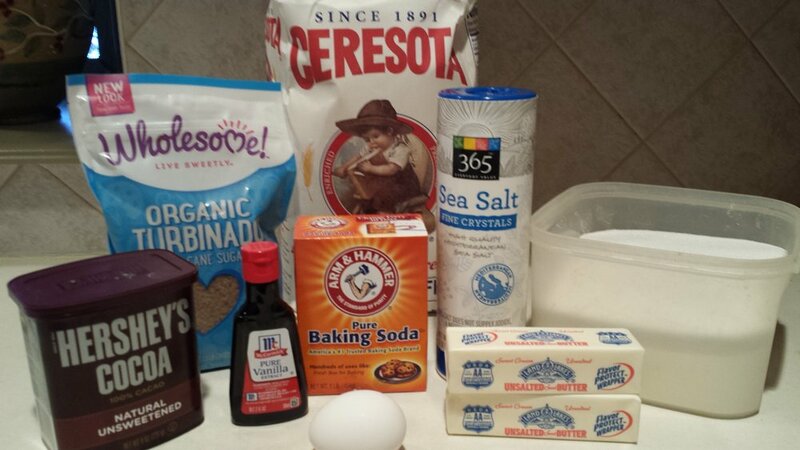 I've got everything ready to go (“mise en place”) for the Blue Cheese Madeleines and it makes everything so easy. Eggs at room temperature, butter melted, blue cheese crumbled and everything else measured out. It all comes together nicely. This goes in the refrigerator for an hour, and that's one of the steps I love. I guess because it gives me time to clean up before putting them in oven. Most of her recipes require you to chill dough. 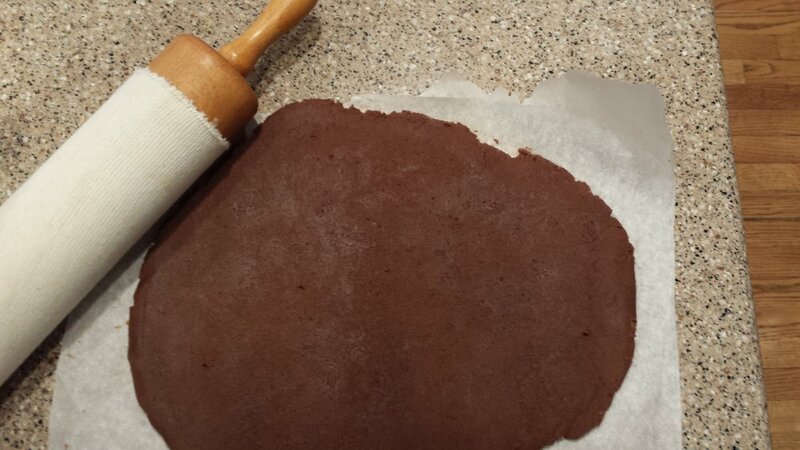 This makes cutting out cookies much easier. It all makes so much sense. Just took them out of the oven. Only 11 minutes and they were done to perfection, beautifully browned around the edges and golden on top. Now I guess I have to try one, and after one bite, I don't know what to say. It was heaven in my mouth! After savoring this wonderful Madeleine, I started thinking......why not cut it in half, and with a bit of honey mustard and fresh ham, what a beautiful little sandwich it would make. I think it will be another wonderful morsel I'll be serving at my party. I’ve made a few recipes from Dorie’s Cookies now: the meringues, Thanksgiving Bars, World Peace Cookies—and now her Chocolate Chip Not-Quite Mandelbrot! One of the things I love most about the recipes in this cookbook (and there’s so much to love!) is that there is a really wide range in terms of difficulty, flavors, textures, etc. There is a good chance that you already have everything you need to make these cookies in your pantry already (except maybe the mini semi-sweet chocolate chips) and the recipe comes together quickly and easily. The mandelbrot are basically a biscotti, but with a more cake-like texture, i.e. not as dry as typical biscotti. She explains that traditional mandelbrot incorporates almond, but these actually don’t have any almond; they are quite delicious just using vanilla extract. They’re sprinkled with a cinnamon-sugar mixture before both bakes, which makes the whole house smell good while they’re in the oven! The best part is that the mandelbrot will keep at room temperature (covered) for a couple of weeks, or up to two months in the freezer. You can easily whip up a batch this weekend and have a full cookie jar when guests arrive for the holidays! I’m from a big Italian family and Christmas just wouldn’t be Christmas without dipping biscotti in your morning coffee (or wine…though hopefully not in the morning!). This is a very basic dough that you can easily play around with, too, and try other fillings and flavors. If you’ve never made biscotti before, these are a good place to start! Adrienne (one of eight sisters) is on the left. Brrr it's cold! The morning weather report said that it would be "the coldest morning "so far this year, so of course when I heard this, I decided it was a good day to bake some cookies. Baking reminds me of my Danish mother, who loved to bake and we loved to eat whatever she made! I decided to bake the Pfeffernusse cookie. So easy and tasty! This cookie is very popular in Europe for the holidays. They taste fresh for days - no worries there though, your family will gobble them up. The ingredients include orange peel, nutmeg and white pepper, just to name a few. I rolled mine in powdered sugar because it reminds me of the first snow. Dorie also has a nice chocolate and espresso bean glaze recipe for her Pfeffernusse – I think I will use that the next time! Happy baking and Merry Christmas. The story behind the recipe for Melody Cookies in Dorie Greenspan's cookie book is that she recreated a Nabisco cookie that held fond memories for her husband. Although I don't remember these cookies from my childhood, I think you can't go wrong with chocolate, butter and sugar! The dough is chilled and then cut out and sprinkled with a coarse sugar to give an extra sweetness and crunch when you bite into the cookie. I ended up with a thicker cookie than the 1/8" Dorie recommends so definitely needed the glass of milk nearby, but I liked the results with the scalloped edge cutter. 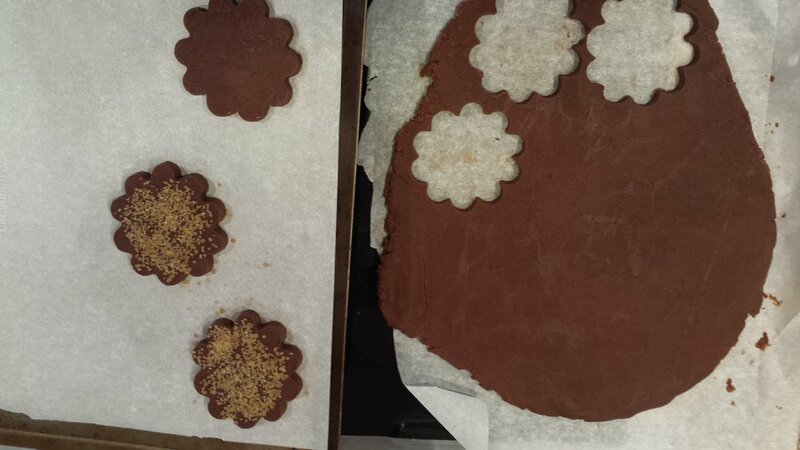 A couple of days later I made the rest of the dough into star shapes and tried a drizzle of chocolate across the top so use your imagination for shapes and toppings and you will be singing a beautiful melody as you eat these Melody cookies! A couple special guest bakers this week tried out the Snowy-topped Brownie Drops. 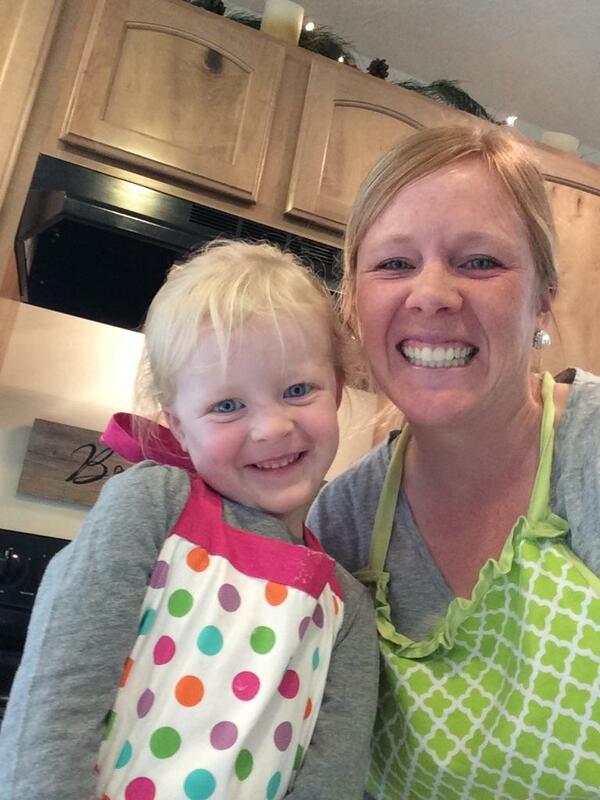 My niece, Lauren, and her daughter, Emery, baked up a batch and you can see they had a grand time. 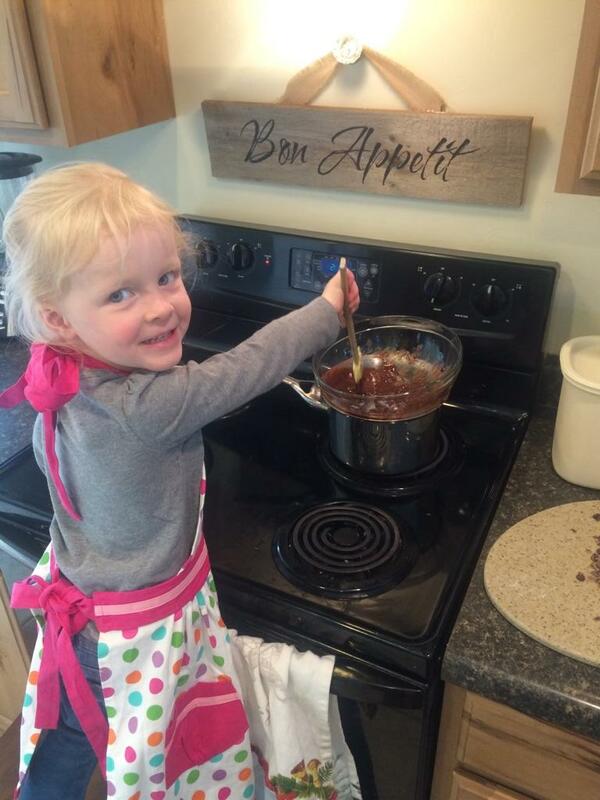 Lauren bakes cookies for friends and family and enjoys having Emery in the kitchen with her. 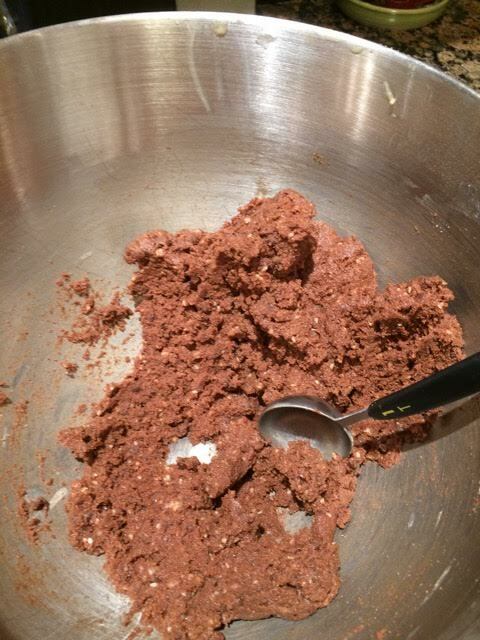 The chocolate is melted on the stove and then the rest of the ingredients are added before the dough is chilled. 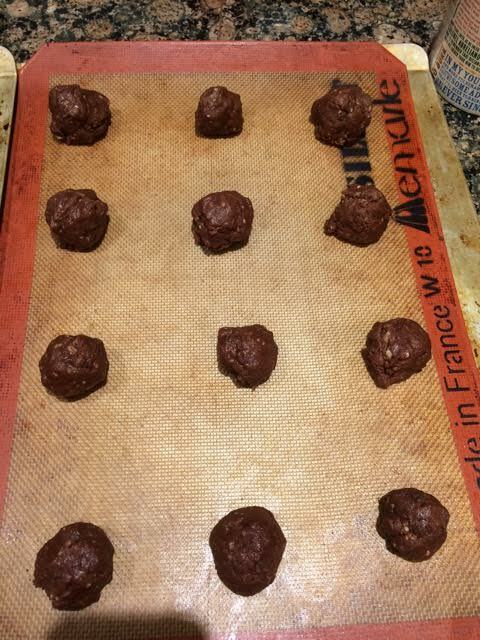 Rolling the chocolate balls in confectioner's sugar gives these cookies an extra special coating that pairs nicely with the chocolate. Invite some friends over for a relaxing evening of cookie making and be sure to include this recipe because it is a winner!